inside a thorn wreath with three flowers, a crown and sun rays, below the crown two entangled C's with Roman numeral II centrally (Carol II monogram), ribbon bent twice tying the thorn wreath, on which lies NIHIL SINE DEO. Along and near the edge the inscriptions ROMANIA, 8 IUNIE 1930, 8 IUNIE 1940, face value 20 LEI. the legend CAROL II and, between an oak branch (at left) and a laurel branch (at right), REGELE ROMANILOR meaning "KING OF ROMANIANS", and the effigy of Carol II to the left. Under the neck lies the name of the engraver, E.W. BECKER. The bust of Roman Emperor Trajan to the right, wearing laurel wreath, supporting in the left hand the steel crown of Romania, holding a sword in the right hand (leaned on the shoulder). Around the sword is a wreath made of oak leaves. In the background lies a wheat field. In exergue: 8 IUNIE 1930 / 8 IUNIE 1940. Without face value. along the edge inscription CAROL II REGELE ROMANILOR meaning "KING OF ROMANIANS", in the middle the king on horseback riding left, wearing royal guard uniform and the cloak of Michael the Brave's Order, holding marshall baton. In exergue two branches, above them inscription 10 ANI meaning "10 YEARS". Along the edge, at the bottom left, the name of the engraver, E.W. BECKER. Along the edge inscriptions 8 IUNIE 1930 (at left) and 8 IUNIE 1940 (at right), at center, on a wheat field, Carol taking an earthenware pot with water from the peasant woman Modura. Behind Carol the propeller of an airplane and, in the background, sunrays and hills. In exergue is a small branch. Without face value. along the edge inscription CAROL II REGELE ROMANILOR meaning "KING OF ROMANIANS", in the middle the king on horseback riding right, wearing royal guard uniform and the cloak of Michael the Brave's Order, holding marshall baton. In exergue two branches. Along the edge, at the bottom right, the name of the engraver, E.W. BECKER. 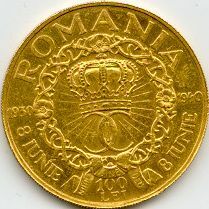 The gold coin pictures above are present on Romanian Coins through the kind permission of Mr. J. Ardelean. 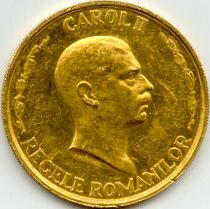 The six gold coins set (after some sources, there are two sets of three coins each) was struck to celebrate the tenth year of reign for Carol II. The great gold pieces, having 41 millimeters in diameter and 42 grams, also known as Emperor Trajan respectively Peasant Woman Modura - were defined by the coin set emission Law nr. 1775 from June 1940 as decorative coins. The great gold pieces are close to medals. Based only on the leu/gram ratio, they must have a face value of 129 lei and several bani. It seems that the peasant woman Modura is the woman that, on June 7th 1930, brought water to Carol to drink. That day Carol unexpectedly entered the country and, heading to Cluj-Napoca, landed with his airplane at Vadul Crişului, near Oradea, due to the lack of fuel. According to Schäffer - Stambuliu catalog in 2009, the mintage of 20 and 100 lei was 346 pieces each, and 348 each for the great gold coins. In 2013 Romfilatelia put on sale a series of four stamps, under the name of "Numismatic Collection of the National Bank of Romania - Romanian Golden Coins" [Colecţia numismatică a Băncii Naţionale a României - monede româneşti de aur]. The highest value features one of the golden 20 lei from 1939. 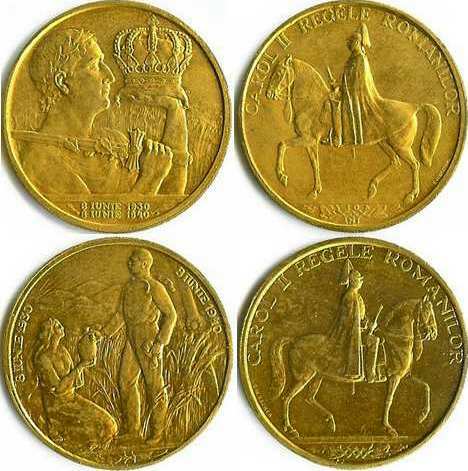 On the page describing the series on the Romfilatelia website, the information exists about the mintage of the 1939 and 1940 golden coins: each of the six coins from 1940 would have been minted in 500 pieces, according to this account. The site hints somehow that this information comes directly from the NBR. It is very interesting to observe that the 20 lei 1940 pieces (and the 20 lei coins from 1939, presented on the previous page) have 6.5 grams. 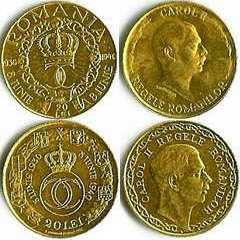 The 20 lei coins struck under Carol I (in 1868, 1870, 1883, 1884, 1890, 1906), and the coin struck in 1927 and bearing the effigy of king Ferdinand (and year 1922) have 6.452 grams. The coin-medal "Transylvania of Ours" is a bit heavier than the regular 20 lei coins, having 6.55 grams instead of 6.452 grams. As you see on the obverse, 8 IUNIE (JUNE 8th) 1930 is the celebration day. That is the day Carol II was voted king by the Parliament, through an unconstitutional act succeding his return in the country the previous day. In 1927 king Ferdinand closed his eyes forever and Carol II should have followed, the last being married to the Greek princess Elena and having a child with her called Mihai (Michael). He was not such a good husband and father as he left his wife and children for a certain lover of his, Miss Wolf, and as he was not to become a good king either. Consequence of this absurd situation, in 1926 already Carol II had given up his succession to the throne completly accordingly to the apliable laws and the Romanian parliament had sanctioned this renunciation. So, the young Mihai became in 1927 the LAWFUL king (the year king Ferdinand died), a regency being made up for him, chief of which being patriarch Miron Cristea as head of the Church. That explains the coins struck in 1930 having a child king on obverse. Helped by the Liberal Party, Carol II returned to Romania in 1930 as usurper of his son to become an unlawful king, technically speaking, through a coup d'état and openly violating the Constitution. Carol II brought immorality and corruption to Romania. He became dictator in 1938. Due to the internal and foreign hardships of the time, Carol II in 1940 already reckoned himself uncapable of reigning on and adbicated in favor of his still young son, leaving the state power to general Antonescu. The former king settled in Portugal and married eventually (in 1947, at Rio) to the woman that he openly held lover for so very long in contempt of such a religious people as the Romanians. The earthly remains of king Carol II returned to Romania on 13th of February 2003 and were buried the next day in the royal burial abbey of Curtea de Argeş. The pictures of 20 lei 1940 coins above are present on Romanian coins through the kind permission of an anonymous donor. 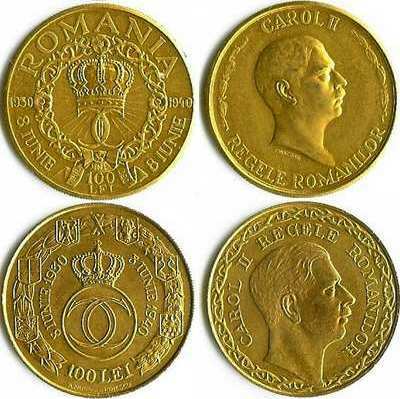 The pictures of 100 lei 1940 above is present on Romanian coins through the kind permission of Mr. Clark Smith, numismatist and renowned specialist in world gold coins.